Perfectionism can cause paralysis. It creates fear and stops you from living your dreams. When you're worried about making everything perfect, nothing gets done. 1. Pay attention to your inner thoughts. Perfectionism can sneak up on you and take over your thoughts. Listen to your self-talk. 2. Just get things done. When you're too focused on making everything perfect, it slows you down. Instead, remember to stick to a schedule and meet deadlines. * Make your standards realistic. * Focus on completing tasks on time instead of getting lost in the tiny details of each assignment. * Take action. Keep moving forward. Remember, you can improve, if you need to, as you go along. 3. Forgive yourself and others. Forgiveness can free you from perfectionism. Remind yourself that no one is perfect, and everyone has faults. Learn to forgive yourself and others for mistakes. * Try to find beauty in the imperfect. 4. Keep in mind that second chances are usually available. Even if you can't do something perfectly the first time, you may have the opportunity to fix it later. Instead of focusing on what still needs to be done, focus on your wins. Each time you finish something it's a small victory. It's important to celebrate your accomplishments - even small ones. * Take a moment to celebrate and say thank you. Do something special for yourself. 6. Avoid being overwhelmed by a mistake. Perfectionists can get upset when things go wrong and tend to overly blame themselves. You can take responsibility for your role in the mistake without being overwhelmed by it. * Learn to reframe the experience. Focus on the positive aspects, such as the lessons the mistake has taught you. * Keep in mind that failure is a normal part of the journey to success. * Avoid spending days going over the mistake in your mind. Learn to move past it. 7. Find balance in your life. 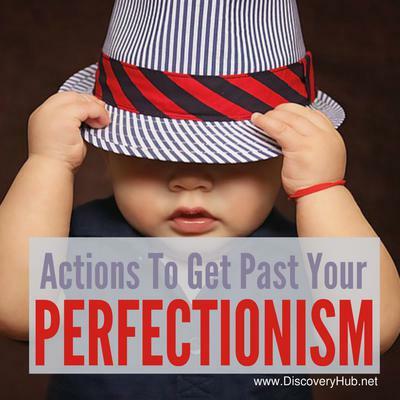 Perfectionism can creep into many parts of your life. It can take over your family, relationships, and career. It's important to strive for balance. * Try to avoid focusing on just one aspect of your life. Instead, keep things balanced by spending time with friends, family, and coworkers. * Avoid neglecting important things such as your hobbies, personal health, or children. Changing how you think about things can be a powerful way to combat perfectionism. The way you view the world can influence every part of your being. Learn to find the good in everything and be happy with it. * Do you have an all or nothing attitude that paints everything in black or white? Or can you see the gray areas? * The key to avoiding perfectionism is to realize that the world isn't divided into perfect parts that can always be analyzed. Instead, it's a complicated mix that has many moving parts. The same applies to your mind. * Focus on making progress. Even a failure is progress because it moves you closer to finding success. You can learn to move past perfectionism. Practice these tips. Once you free your mind from perfectionism, you'll feel happier and success will come easier to you. Must You Have Optimism to Succeed? Do you really need optimism to be successful? It's a useful trait and linked to many positive outcomes. Many business owners and leaders share that optimism is an essential part of their growth. 1. Optimism has many benefits. Being optimistic can strengthen your physical, emotional, and mental health in ways that help you succeed. * Optimism can strengthen your cardiovascular health and immune system. Other positive health effects include having less pain and stress, recovering from illness faster, and having lower rates of cancer. * Optimism can also have emotional and mental benefits. It brings you a more positive outlook on life. As a result, it's easier to bounce back and move forward again after setbacks. 2. Optimism gives you the drive to try. Pessimists rarely want to try new things, so they don't get a chance to find success. On the other hand, optimists are willing to experiment and are more likely to succeed. * You have to be willing to do new things and make changes to find success. * In business and in life, itÕs important to be flexible, so optimists have a higher probability of making their dreams come true. They're willing to keep fighting for their goals. * Optimists also tend to be willing to take more risks. They're less likely to wait and see what will happen. Instead, they take the necessary actions to move ahead. 3. Optimism gives you a positive focus on the future. Instead of getting hung up on the past, optimists tend to look toward the future. * Researchers have found that thinking about the future in a positive way can increase your success. You're motivated to keep going and refuse to give up because you know better things are ahead. * Studies have also found that optimism about the future also increases creativity. 4. Optimism gives you perseverance. One of the reasons people don't find success is because they give up too soon. * Optimists view challenges and roadblocks as normal parts of the process to find success. They're resilient and strong. So they keep moving forward toward their goals. * Businesses can fail, but optimists are willing to start over again. They're also willing to learn from their mistakes and rebuild with this knowledge. * Optimists are both emotionally and mentally strong. They don't allow issues to stop them or tear them apart. They understand that success or failure is a small part of their lives and doesn't define them. 5. Learn from successful optimists. * Dr. Norman Vincent Peale was a famous author and optimist who sold millions of books about optimism. He's a perfect example of how this trait can lead to success. * Another famous optimist was Andrew Carnegie, who built a business empire and was one of the richest people of his time. He frequently credited his optimism for his success and was admired by others for this trait. * Nelson Mandela was also an optimist who believed it gave him hope. He was a famous political leader who survived decades in jail and horrible conditions to return to power. Optimism is a crucial part of finding success. It helps you to stay motivated and determined as you work toward your goals. Can you succeed without it? It's possible, but so much more probable when you're an optimist. Learn more here in my online self help super-site about how to use free daily motivation to become happier in your life.